← Island of the dog. Are you a U.S. citizen? Want to travel to Iran? Here’s how. 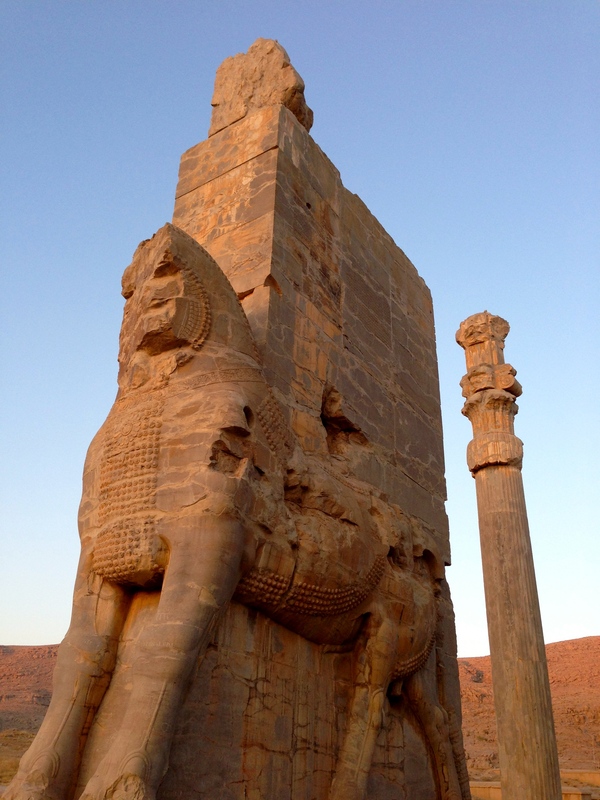 Photo: at the Gate of Nations at Persepolis, Iran. First, the “safety” issue. I was lucky to know Iranians who’d (graciously) corrected my worries that the country would not be safe for me as a U.S. citizen; when I was actually there, those fears seemed downright absurd. I never felt unsafe. Iranians themselves generally have very warm feelings toward the U.S.; they received me with nothing but kindness, grace, and curiosity throughout my travels. Step 1. Contact a travel agent within Iran, which will sponsor you for a visa and, in effect, be responsible for you while you’re in the country. I highly recommend Babak Kianpour, an independent agent who arranged nearly all of my travel. He works closely with the Boomgardi Institute for Sustainable Tourism, a network of gorgeous traditional houses across the country, several of which I stayed in. Babak is a dual American citizen, fluent in English, French, and Farsi, and can be reached at adventure.wb@gmail.com. Step 2. Babak will help you apply to the Iranian government for a tourist visa authorization code. This is not the visa itself, only a code that says you have permission to get a visa. He’ll charge a fee to handle this paperwork for you—about $100 USD. It’s difficult to say how long it’ll take for the authorization code to come through, but plan for at least a month. Step 3. Once the authorization code comes through, Babak will notify you. Fill out Form 101 from the Iranian Embassy web site and send it with your passport to the Embassy of Pakistan in Washington D.C., which has a “Special Interests of Iran” department. (If you’re a woman, you’ll need to get a passport photo taken in a headscarf.) You can pay an extra fee to expedite processing—I did, about $60—and followed up daily by phone. I got my passport back in only a week. Step 4. Once you have your visa, Babak will find a guide for you. Note that currently, U.S. citizens must be accompanied by a guide in Iran at all times, except in the hotel. There are only 130 guides in the country specifically licensed to accompany U.S. citizens. This sounds onerous—and inshallah, that rule will change someday soon—but I found it easy to negotiate the need for space with my guide. The trip is still so-damn-worth-it. Step 5. Pack! You’re SO LUCKY you’re going to Iran! A good place to get oriented is Lonely Planet’s guide. (I don’t recommend the Bradt guide, which reads like a phone book.) It’s up to you exactly when to buy your plane tickets, but I bought mine well in advance of having the visa in hand—I had a layover in Istanbul, and told myself that if the visa fell through, I’d stay in Turkey instead. And finally, instead of buying plane tickets yourself, I highly recommend emailing Susi at World Travellers’ Club. She’s consistently found prices for me that have made my jaw drop. Questions? Email Babak at adventure.wb@gmail.com. He’s wonderful. It was great having you visiting Iran , and i am happy that i could be part of it . we look forward for you new book. Great post. I’ve been looking for recommendations on travel to Iran for a while (check out my question about it on Quora: https://www.quora.com/What-are-some-tips-for-an-American-planning-a-trip-to-Iran or my blog: finnismundi.com). Thanks very much for posting such clear tips. I’ll definitely look at Setareh Elahiyeh. I am honored to be able to serv other people around the world to visit Iran . Feel free to contact us . the first thing is about the dates. I highly recommend that you visit Iran early summer or late autumn ..
there are alot of tips for this trip . Thank you SO much for this article/blog. I’m trying to plan a trip to Iran and am finding it not so easy considering I don’t have super flexible dates and so can’t do a traditional tour group. I have emailed Babak and hopefully he can help! Hi Monica, thanks for this blog post, it’s been very informative! I’m waiting to hear back from Babak, but in the meantime, did you have to get travel insurance through any specific agency? I read somewhere that it’s required to have?